this video was produced by the design program from the secretary of development of the state of rio de janeiro for the first brazil design week, held at the modern art museum of rio from 9th to 14th of september of 2008.
five designers living and working in rio talk about their views and show an example of their work and how they are influenced by the beautiful landscape and environment as well as the typical "carioca" behaviour. the designers are guto indio da costa, ana couto, fred gelli, ricardo leite and andré stolarski, owners of five of the biggest design studios in rio. in the final part of it, governor sérgio cabral testimonies about the "creative trademark" of the city. 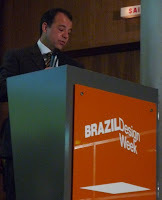 the governor of the state of rio de janeiro, sérgio cabral, made the inaugural speech of the brazil design week, at the modern art museum of rio de janeiro. the event, with lectures, workshops, exhibition, trade show and business meetings is already a success from its very begining, and it is expected to shake the design scene in the country in a way never seen before. take a look here at some pictures of the official events and also of rio+design, promoted by the secretary of development from the state of rio de janeiro. the party has begun! rio de janeiro, from now and at least for the next week, is officially the brazilian capital of design. the first events of rio+design happened today, focused initially in the "charm tetragon" of ipanema (a region of a few blocks where are located many design, jewelry, fashion shops, good restaurants and many other trendy commerce). view photos here. in the first day of design inaugurations, cocktails and open houses received the prestigious visits of rio de janeiro state secretary of development, julio bueno, and the subsecretary of commerce, dulce ângela procópio, both of which have done a lot as political articulators recognizing the importance of design. along this week will be posted more information and pictures about the brazil design week (that officially begins tomorrow morning) as well as rio+design. at the photo above, elisa ruiz (ddi spain), vera riemer (abedesign), tae-wan kim (kidp korea) and gilson martins, host at the cocktail party at the exhibition at his shop during rio+design.